Watch this short photo gallery video from our October Celebration! This event is FREE and is being graciously hosted by SHE Living. Come celebrate the launch of “The Embodied Teen,” the first book to offer a somatic movement education curriculum adapted to the unique needs of adolescents. Educators, dancers, healers, and practitioners working with teens and young adults are all invited to celebrate and launch this important work into the world. Teens and parents welcome too! 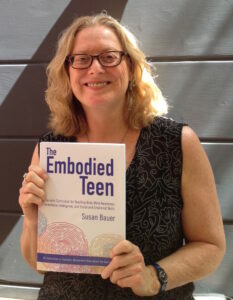 Author and somatic educator Susan Bauer, will be on site to sign books and answer questions. She will also be acknowledging all those who participated in bringing this book into fruition. – Bonnie Bainbridge Cohen, developer of Body-Mind Centering® and author of Sensing, Feeling and Action. Books also available for purchase on Amazon, North Atlantic Books, and other major book sale venues.